Free download QTranslate 6.3.1 latest version. 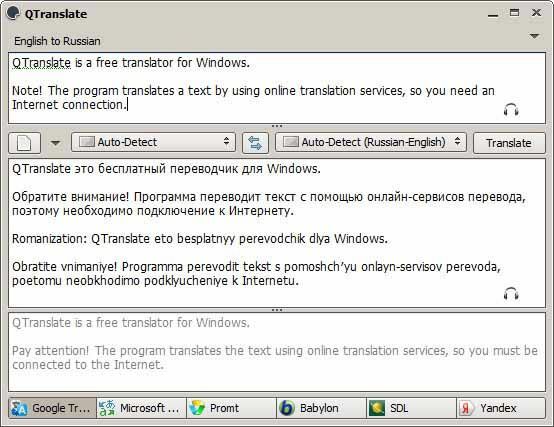 QTranslate is a free translator for Windows (Windows 8/7/Vista/XP). With this small utility, you simply select the text you want to translate and then press the hot key (Ctrl+Q to show translation in the popup window or Double Ctrl click to show the translation in the main window). The program also has the ability to speak text Ctrl+E and perform a dictionary search Win+Q. Also, you can open the main window and type text manually. The program translates text by using online translation services, so you need an Internet connection.